You will never need another tool! The Scrigit Scraper is a handy cleaning tool that provides a quick, safe and convenient way to remove small amounts of unwanted substances from household and automotive surfaces. This handy scraper was developed to fill a large gap in the current market for cleaning tools. There is often a need to quickly clean small spots of unwanted substances or reach into edges, grooves and other tightspaces without damaging the surface being cleaned. We have been completely amazed at the many things we can use the Scrigit Scraper for. Things you think are too hard to get to or remove can be done with the Scrigit Scraper. The perfect thing is it’s able to do all of this without damaging surfaces! I can’t imagine being without my Scrigit Scrapers! They are so handy I keep them all over the house and even 1 in my car. 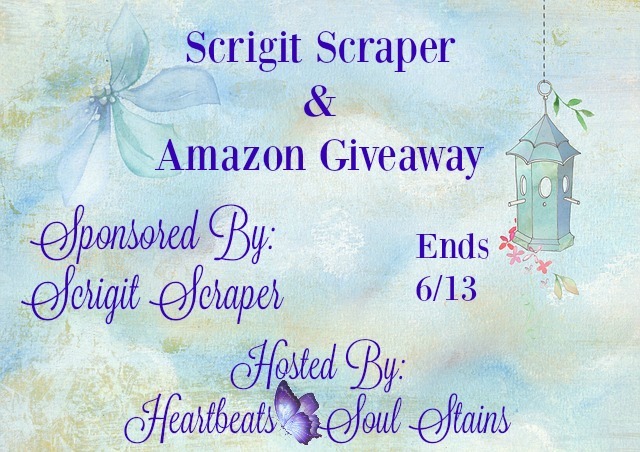 Scrigit Scrapers & Heartbeats~ Soul Stains would LOVE your help promoting this giveaway! Co-Hosts Needed: $4 for 5 links of your choice PLUS the 2 FREE links above = 7 links total. ANY links you choose… Facebook Likes, shares and or Comments, Twitter Re-tweets, Website Comments, Giveaway Entries, Daily Votes, Daily Endorsements, Extra Follows, Anything, you tell me! Co-hosts will have a back link in the Giveaway HTML along with a co-host & follow page. Amount of follow pages will be determined by how many sign up to promote giveaway.